Change is a constant and as much of a contradiction this is, this saying that originally came from the ancient Greeks (Heraclitus, a Greek Philosopher is credited for it) has two layers to it. The “constant” refers to the overall timeline while the “change” part talks about the iterations. Malcolm Gladwell spoke about changes in societies in his famous book The Tipping Point. In that book he observes trends and what are the common threads between some of the biggest changes in public policy, fashion trends or successful products. As much as that book focuses on overlaying trends, it presents the process as unpredictable as it is controllable. Crossing The Chasm presents the same process in a more structured way, as it focuses on a creating successful business by guiding you step by step on how to make your product a success. This is one of the must-read books for people interested in building a startup, especially in the Knowledge industry. "The chasm is the boundary that you have to cross to get from a fad to a trend. It's a do-or-die value proposition for high tech companies. If prudence rather than brilliance is our guidance, then many heads are better than one." The first part of the book walks you through the Technology adoption life cycle. The chart that summarizes the idea behind the book is rather famous in itself by now, as it has been embraced by big or small companies alike. Intel or Microsoft face the same hurdles as the smaller startups, even with the crazy amount of data analysis that companies have now, sometimes it’s just a coin toss if a product will be successful or not. Early majority – when there are enough advantages to make it comfortable to switch. Driven by practicality. They rely on references from early adopters. One third of consumers. Late majority – when there are enough disadvantages to stay on the old system. One third of consumers. Courting them is profitable since R&D costs are amortized at this point. The revised adoption life cycle model introduces gaps between each segments. This symbolizes the difficulty any group will have in accepting any product if it is presented in the same way as it was too the group before. Each gap is an opportunity to lose momentum. The 2nd gap between early and late majority is when the product is not made incrementally easier to adopt by the ones who need practicality. The early adopters want a change agent, something to give them competitive advantage and are happy to deal with the bugs. Early majority wants productivity improvements from the technology and the want references. The problem is they want references from other early majority. Marketing, as explained by the author, means taking action to create, grow, maintain, or defend markets. A critical aspect of markets is that potential customers for a giving product or service that have common needs or wants need to reference each other to become a market. Selling to people that can’t communicate with each other is not creating a market. Those people exist in different markets. At best those or categories or market segments. This explains why Uber launched for two years in just one city. Why companies don’t want initial large adoption of their product, because it doesn’t have the productivity gains early majority is looking for. There is a big difference between each group, they react differently to the same need and they have very different expectations from you. For example innovators want the truth, access to the most technical person in your team to help them, they want to be the first to get the new stuff, they work under NDA and provide great feedback. They also want everything cheap or for free. Early adopters on the other hand are visionaries driven by a business goal not a technology goal. Understand their dream and you will understand how to market them. Visionaries are looking for a breakthrough and they take a lot of risk in that. They want a strategic leap forward. They are easy to sell to but hard to please. They start with a pilot and want milestones and project work. They are in a hurry as they believe the window of opportunity will close soon. Getting closure with visionaries is impossible. Expectations derived from dreams cannot be met! Therefore one needs to manage the expectations very closely. The visionaries are usually SVPs with funds to clout their vision. Interestingly enough, they find you and open communications. They do this by staying in touch with the innovators – which is why it’s important to capture the technology enthusiast segments, the innovators. This is where the chasm comes into play. 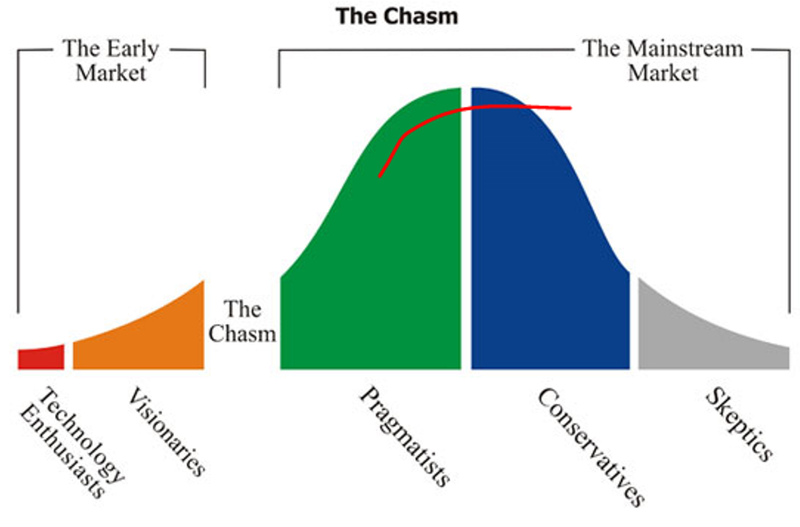 Pragmatists create the chasm because the wait to see who the market leader can be. After they pick you they conspire to keep you as the leader to validate their decision and to create the ecosystem that drives costs down. Crossing the chasm can only be done by finding a beach had. the book has a good call to action here: “Segment segment segment”. Find a market and sell to 5-6 customers. You need references in the same industry and once you crosses the chasm, the industry will want to keep you there. Crossing the chasm represents a transition from product-based to market-based values. The book has a good example, based on online storage services (Sharepoint, Box, Dropbox etc). Market alternative (for Box it was Sharepoint) and product alternative (for Box it was Dropbox). This is the best position to be in as it means you have the best of both worlds. By positioning yourself as Sharepoint, you make it clear you are going after the same use cases and same budgets inside the company. By citing the product alternative, you make it clear that its disruptive innovation is radical ease of use and it’s time to get on the boat. This is very important as it clarifies what your value proposition is! The book is just as much about marketing as it is about strategy. It teaches you how to think from the customer perspective and how to position your product as being easy to buy, not easy to sell. One of the parts that I found particularly interesting is how to work with partners, even treating competitors as partners since it helps create a market for both of your products. It touches on the conventional wisdom that you need to be the first one in the market with a new product and explain what that just doesn’t work in real life. I know I will repeat myself, but I found this book to be a definite must read. 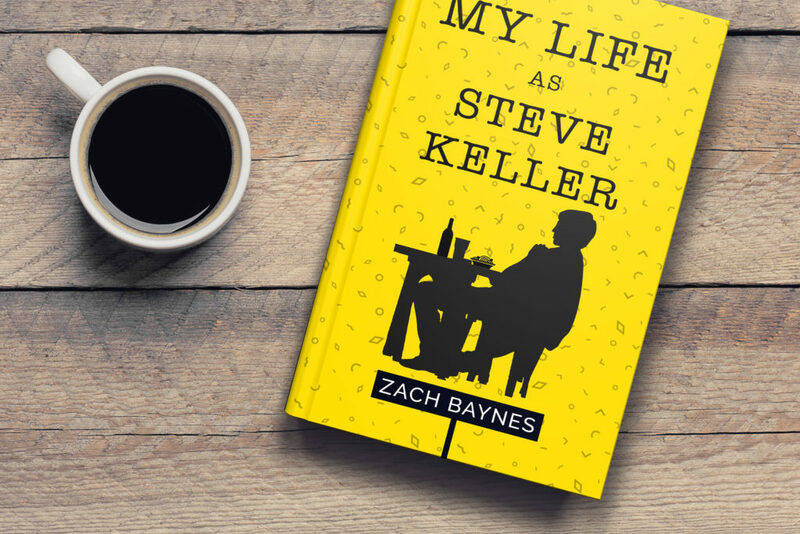 It’s a must read for startups, for people working in Sales or Strategy. It’s also very useful for people working in big companies that are trying to get support for their ideas. There is no difference in pitching your idea within a corporation and trying to get ambassadors/champions for it, or trying to sell a new hybrid laptop-tablet.